The building will be LEED-certified, at the Gold level. 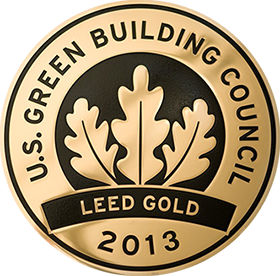 The certificate is issued by the USGBC (U.S. Green Building Council). Additional information: http://new.usgbc.org/about. The aim of the USGBC is to change the practice of designing, constructing, and operating buildings. Internationally, LEED (Leadership in Energy and Environmental Design) is the most widely recognized and used green building certification programme, which offers the owners and operators of green buildings the practical and measurable framework of identification and implementation for designing, construction, operating, and maintaining green buildings. Each day, LEED certifies buildings with a total area of approximately 150000m² in over 130 countries. The LEED programme is used for the certification of buildings, homes, and environments. At the moment, there are about 50000 projects participating in the LEED programme, totalling over 800 million m² of certified construction area.